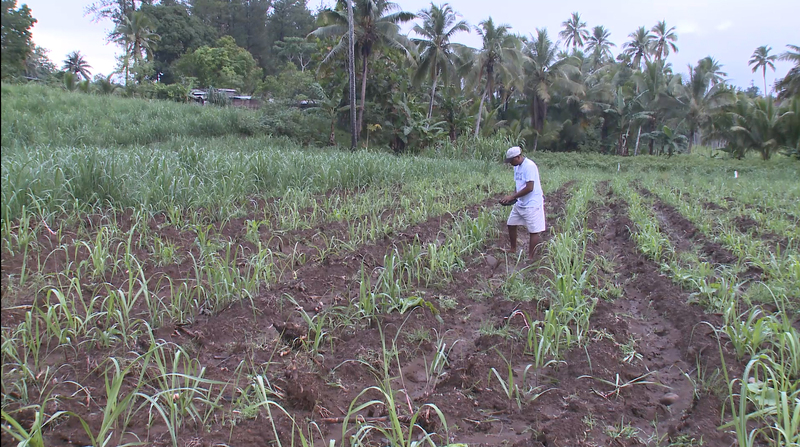 WATCH THE VIDEO Bacardi Limited raises the bar on sustainability. 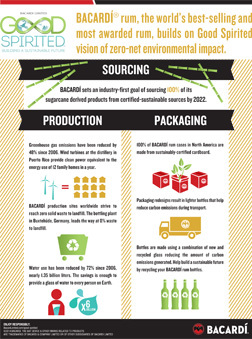 Bacardi considers global environmental innovation part of its DNA. Our goal is to return to the environment at least as much as we take away. 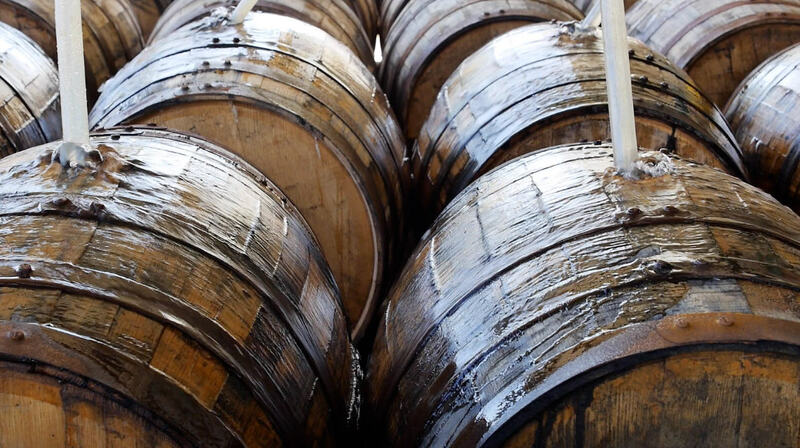 We’re setting a sustainability standard for others in the spirits industry to follow. Learn more about what you can do to help Bacardi rid the world of single-use plastic straws and stirrers below. April is Earth Month – a time to celebrate environmental efforts. Now in its fourth year, the Bacardi Limited “Good Spirited” initiative continues to make an impact as we work together to build a more sustainable future. Check out how employees, partners and communications are making a difference! 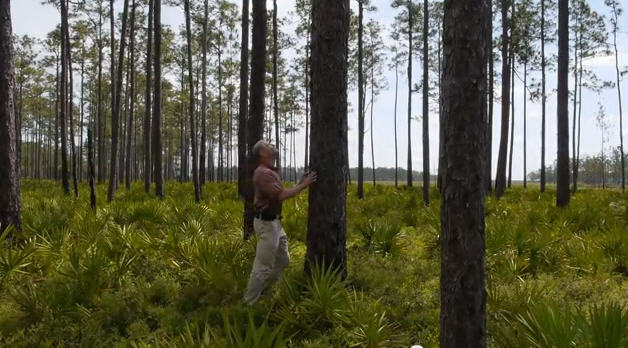 Watch our Good Spirited sustainability story. Learn about our commitments to building a more sustainable future across operations, packaging and responsible sourcing. And learn how Bacardi employees commit to make a difference. 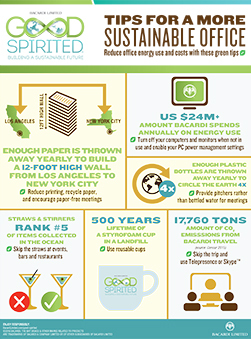 As Bacardi continues to build a more sustainable future, check out these simple tips for a more sustainable office. Through these tips, Bacardi can reduce office energy use and costs. Bacardi continues to focus on water reduction with a goal to cut its global use by 55% by 2022. The Company recycles water used to clean BACARDÍ rum barrels. 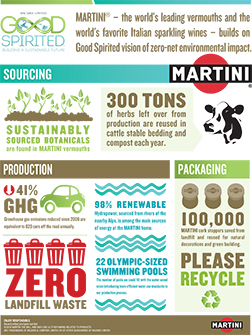 MARTINI®, producer of the world’s leading vermouth and favorite sparkling Italian wines, infuses a vibrant approach to the “Good Spirited” sustainability initiative. The Bacardi-owned brand stands out for its exceptional and good-spirited, environmental practices. Since 2006, MARTINI has cut greenhouse gas emissions by more than 30 percent and water use by four percent. WATCH THE VIDEO The beautiful hills of northwest Italy are steeped in tradition, as well as forwarding-thinking practices for a sustainable future. The region is home to MARTINI®, producer of the world’s leading vermouth and favorite sparkling Italian wines, for more than 150 years. At the main MARTINI facility in Pessione, Italy, almost all of the electricity comes from renewable sources. Sustainable business practices are apparent throughout the campus – from production lines that salvage excess glass to office space where employees engage in a robust recycling program. WATCH THE VIDEO In celebration of World Water Day, MARTINI® maintains an enduring commitment to sustainability. From the breathtaking magnificence of the northern Italian Alps comes pure power – hydroelectric power – that helps drive sustainable production of MARTINI vermouths and sparkling wines. Since 2010, almost all of the electricity consumed at the facility comes from renewable sources, including hydropower. In celebration of World Water Day today, MARTINI®, as part of the Bacardi family of brands, maintains an enduring commitment to sustainability. From the breathtaking magnificence of the northern Italian Alps comes pure power – hydroelectric power – that helps drive sustainable production of MARTINI vermouths and sparkling wines. “Hydropower – the production of electrical power through the use of falling or flowing water – is one of the cleanest ways to produce electricity without significant impact to the environment,” says Fulvio Baratella, MARTINI Technical Service Manager, in charge of environmental engineering at the MARTINI facility. MARTINI - the world's leading vermouth and world's favorite Italian sparkling wine builds on Good Spirited vision of zero-net environmental impact. A stunning Scottish landscape, hard work and steady environmental innovation encompass the sustainable success of John Dewar & Sons Ltd., one of the most respected names in the world of Scotch whisky and part of the Bacardi group of companies. Premium DEWAR’S® Blended Scotch whisky – affectionately known as True Scotch – was sustainable before sustainability was considered cool. 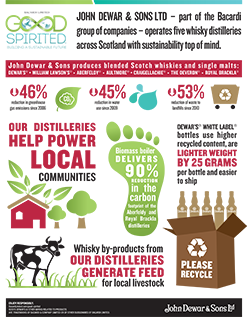 WATCH THE VIDEO Across the John Dewar & Sons distillation and production facilities there are robust recycling efforts, state-of-the-art blending centers, sophisticated water filtration, fuel-efficient transportation and landscaping that enhance the natural habitat. WATCH THE TRANSPORTATION VIDEO WATCH THE CAFE VIDEO The renovated DEWAR'S Aberfeldy Distillery features interactive displays, newly released historic memoirs, a café featuring a locally sourced menu, a robust recycling program and fuel-efficient transportation. Steeped in history and nestled in the heart of the Scottish Highlands is a recently refurbished heritage center for John Dewar & Sons’ DEWAR’S® Aberfeldy Distillery. These environmental innovations are part of a broader scope of sustainability initiatives for John Dewar & Sons, producers of DEWAR’S Blended Scotch whisky, WILLIAM LAWSON’S® Blended Scotch whisky and the single malt brands of ABERFELDY®, AULTMORE®, CRAIGELLACHIE®, THE DEVERON® and ROYAL BRACKLA®. 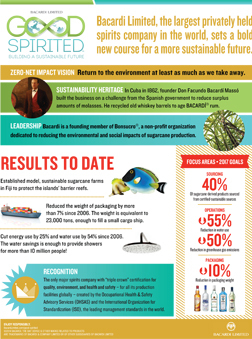 The sustainability program is far-reaching for Bacardi Limited, the world’s largest privately held spirits company, which crafts its award-winning BACARDÍ rums in Puerto Rico and other locations, bottles them in the United States and abroad to distribute to more than 150 countries around the world. BACARDÍ rum production has reduced greenhouse gas emissions by 48 percent and water use by 72 percent worldwide since 2006. Watch the video From one end of the world to another, BACARDÍ rum holds both its operations and suppliers to high sustainability standards. Globally, BACARDÍ rum facilities strive to reach zero solid waste. At BACARDÍ rum production sites globally, leftover packaging materials, including plastic, paper, glass, aluminum and cardboard, are sorted and collected for recycling. BACARDÍ rum sets an industry-first goal of sourcing 100% of its sugarcane derived products from sustainably certified sources by 2022. Bacardi will plant a tree for every bottle of BACARDÍ® Superior, BACARDÍ® Gold, or BACARDÍ® Select rum (750mL and 1.75L sizes only) sold in Idaho retail stores from today through March 31, 2015. Donations to American Forests will be based upon on and off-premise sales in both the State Stores and Contract Stores in the State of Idaho. BACARDÍ rum is the world’s most awarded spirit, having garnered more than 550 awards, accolades and recognitions for quality, taste and innovation from around the world. The Bacardi Bottling Corporation in Jacksonville, Fla., welcomes wildlife of all types on its 92-acre industrial site. Through its eco-conscious efforts to help pollinators thrive, the bottling plant works to fulfill its Good Spirited sustainability initiative of putting back at least as much as they take away. The campus’ animal-friendly conservation efforts include a monarch butterfly habitat, blue martin bird houses, and bat houses, with a plan of adding honeybee hives in the future. The site’s dedication to biodiversity has earned it a Wildlife Habitat Council Conservation Certification. WATCH THE VIDEO The iconic gin brand merges history, heritage and architectural beauty with environmentally friendly technology and materials in its BOMBAY SAPPHIRE Distillery at Laverstoke Mill. The state-of-the-art distillery and brand visitor center in England was awarded the prestigious 2014 Building Research Establishment Environmental Assessment Methodology (BREEAM) Industrial Award, the world's foremost environmental assessment method and rating system for buildings, for its design. The Bombay Sapphire Distillery team, based at Laverstoke Mill in Hampshire, UK, have been on a volunteering day in the Polden Hills, Somerset, to support a wildlife cause inspired by their love of the British countryside, and the iconic blue Bombay Sapphire bottle. The globally endangered Large Blue is the UK’s rarest butterfly. The story of the Large Blue caught the imagination of the Bombay Sapphire Distillery team because this enigmatic butterfly, which was declared extinct in the UK in 1979, brings remarkable blue colouring to the British countryside. The Bombay Sapphire Distillery team has been working with leading charity Butterfly Conservation to find ways they can support their Large Blue projects. It’s only through careful research, targeted conservation work and a successful reintroduction programme by Butterfly Conservation and partner organisations, that we are able to enjoy this beautiful butterfly today. The Large Blue has been successfully reintroduced to Somerset and the Cotswolds, and it is this conservation work that the team at the Bombay Sapphire Distillery have been helping to support. The team spent the day clearing scrub from a Somerset Wildlife Trust reserve in the Polden Hills, improving the habitat networks as part of a Heritage Lottery Fund project to ensure these threatened butterflies become more sustainable and spread to new areas within the landscape. 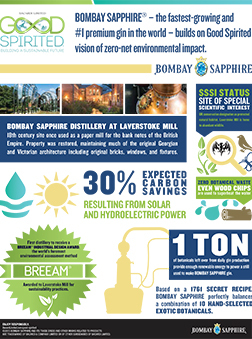 BOMBAY SAPPHIRE® - the #1 premium gin in the world - builds on Good Spirited vision of zero-net environmental impact. In case you haven’t noticed, the world today is pretty much buggered. Global warming. Deforestation. Disposable forks. Plastic straws. They’re wreaking havoc on our precious little planet, and if we continue to let this happen, we’re all dead. So the good people at 42BELOW® vodka have decided to launch their own kiwi planet-saving initiative and are introducing ‘42BELOW Recycled Cocktail Lemons Eco Soap.’ The world’s first soap made from recycled cocktail lemons, and probably the odd martini olive. It’s recycling, on a sociable scale. So how does it work? 42BELOW has been busy signing up a number of bars across Australia and New Zealand and collecting their old, used lemons and fruit that was once the hero of your delicious cocktail. Following collection, the old lemons are sent to the 42BELOW top secret lab, ingeniously turned into liquid lemon soap and then sent straight back to the bars for free. With the initiative launching in early December 2016, they have already collected 400kgs of fruit waste which in turn has helped them create 20,000 sachets and 400 bottles of liquid soap. Or in drinks terms, 3,200 cocktails! Why are they doing this? Because since 1998, 42BELOW has made the purest vodka on the planet. They reckon that if anyone sullies our beloved paradise called Earth with their filthy pollution, it’ll be that bit harder to create such a pure tipple. And our kiwi brethren don’t want that. In August, 42BELOW hosted the Cocktail Earth Cup, where bartenders designed delicious eco-friendly, zero-waste drinks. They then partnered with Junkee Media and got Aussie’s brightest young minds (the Kiwis were busy) to come up with innovative ways to keep our planet pure. And now, with ‘42BELOW Recycled Cocktail Lemons Eco Soap’ this is their third planet-saving initiative in as many months. Few things are more organic than growing your own renewable fuel like Tequila CAZADORES® does in the picturesque Highlands of Jalisco, Mexico. The premium tequila brand’s fairly new, massive biomass boiler sits juxtaposed to the peaceful, rolling Arandas hills and fields ridged and furrowed with red earth and orderly lines of spiky blue-leaved agave plants. Nothing goes to waste here. The plants are used to make the liquid and power the distillery. With parts large enough for groups of people to walk through, and a colossal arrangement of pipes and rugged engineering, the new boiler at the Tequila CAZADORES distillery is 100% biomass fueled and is a model of forward-thinking, eco-conscious ingenuity. WATCH THE VIDEO With rugged engineering and a colossal arrangement of pipes, the Tequila CAZADORES® distillery in Arandas, Mexico, derives all power for distillation from its modern, clean-burning biomass boiler. Built to harness every bit of green energy it can, the plant-fueled biomass boiler reduces the distillery’s greenhouse gasses. 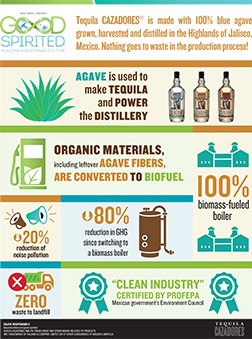 As Bacardi continues to build a more sustainable future, learn how nothing goes to waste in the production process at its tequila distillery in the Highlands of Jalisco, Mexico, with its new 100% biomass-fueled boiler.